The Entrepreneur Experience®, a 24 Hour Experience, is a unique opportunity for 24 Entrepreneurs to gain unparalleled access, advice and mentoring from 24 of Ireland’s most successful Entrepreneurs and this year took place on the 7th & 8th April in Ballymaloe, Co. Cork. 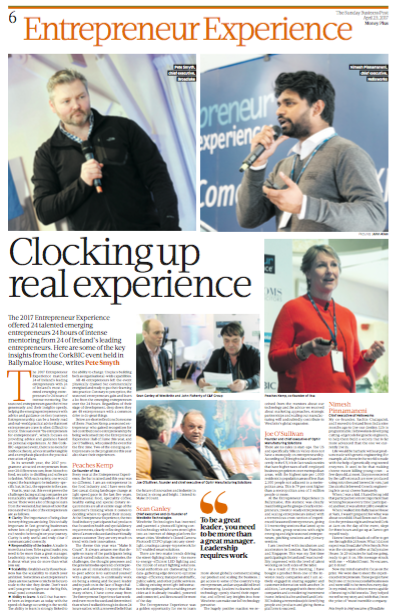 Pete Smyth, Captain for the 2017 Entrepreneur Experience, looked back at the event in a recent article for the Sunday Business Post. This is an event "By Entrepreneurs for Entrepreneurs" which focuses on providing advice and guidance based on personal experiences. At this CorkBIC organised event there is no room for text book theory, advice must be tangible and an emphasis placed on the practical execution of plans. In its seventh year the 2017 programme attracted entrepreneurs from over 20 different sectors from Biotech to Food, Security to Distilling and Software to Fashion. With such variety, one would expect the learnings to be industry specific but in fact the opposite is the case. Year in year out this event proves the challenges facing scaling companies are remarkably similar regardless of their sector. Clarity: The importance of being clear in everything you are doing. This is vitally important in fast growing businesses where lots of people (staff, customers etc.) need to be brought on your journey. Clarity is only useful and truly clear if communicated right. Responsibility of the Leader: A leader is more than a boss. To be a great leader you need to be more than a great manager. Leadership requires work. Leadership is about what you do more than what you say. Scalability: Establish early if your business has the scalability to match you ambition. Sometimes an entrepreneur’s plans are too narrow or niche in focus to scale to the size they desire. Don’t wait until you grow to figure out the "big fish small pond" conundrum. Ability to Learn: A skill that has never been as important as today with the speed of change occurring in the world. The ability to learn is strongly linked to the ability to change. Utopia is building both as organisational wide capabilities.